Hello, and happy February! It is finally the month of love in Kirkland and it’s time to start thinking about what you are going to do for your sweetheart. Yes, you could take them to a steak dinner like everyone else is doing. Or, you could fix them a candle-lit dinner at home — which, kudos to you! But, what about doing something different, cultured, and fun? 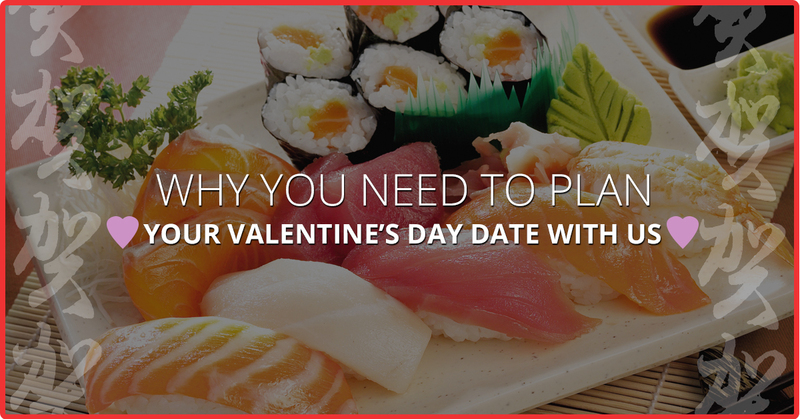 Why not take your valentine to a sushi dinner? Let’s be real for a second, either you are in the dating phase in which you are looking to impress your new love or maybe you’ve been with your partner for a long time and you’re desperate for ways to spice up your Valentine’s Day date. Regardless, sushi can be just the right combination of flavors to spice up your February 14th and here’s why. The way a person eats sushi can show you a lot about a person. Apparently, more and more women are taking their dates out to sushi on their first date. Why? They want to see how the person not only eats their sushi, but also how adventurous they really are. If someone is cultured and likes trying new things, then they most likely have eaten sushi before and know, at least, the basics about eating sushi. Also, it shows how open their date is to a new experience, if this is their date’s first sushi dinner. Sushi is healthy and delicious. If you have been keeping up with our blog series, you will know that we have been talking about the health benefits of sushi. We don’t want to, as the saying goes, beat a dead horse. However, if your date is health-conscious and looking for more than a steak dinner, sushi can be a great alternative. Take your date out and show them how well you can take care of them by delighting their taste buds and nourishing their body. We understand that not everyone likes raw fish . . . that some are actually completely repulsed by it, but a) not all sushi is raw and b) sometimes they just need to try it. We don’t suggest forcing someone to try sushi, especially on your Valentine’s Day date — because that’s not romantic at all — but if they are the adventurous type and they agree to it, then why not? Or, maybe your date loves sushi and you’re a little unsure. Having a new experience together or sharing something that you or your date loves can bring you two together even closer and the experience can be incredibly romantic. It might be awkward . . . but isn’t that how memories are made? Sushi can mean a new experience for you and your date or maybe you both love sushi. Regardless, eating sushi means using chopsticks and sometimes eating with chopsticks can be difficult, awkward, and the accidental means for making lasting memories. None of us want to look like an idiot in front of our date, but sometimes a chopstick mishap is an opportunity to laugh, loosen up, and even have a special, and maybe embarrassing, memory with your date. Come into our Japanese restaurant in Kirkland this Valentine’s Day for a sushi date that you and your date won’t forget!